The International Institute for Environment and Development by Khanh Tran-Thanh. Since pre-Hispanic times, a co-evolutionary relationship built around management of biocultural resources with the mountain environment in Cusco Valley, Peru, has produced the ayllu mindset. While most studies describe ayllu as a political and socio-economic system, few systematic analyses of the ayllu as an ecological phenomenon exist. We understand the ayllu as a community of individuals with the same interests and objectives linked through shared norms and principles with respect to humans, animals, rocks, spirits, mountains, lakes, rivers, pastures, food crops, wild life, etc. The main objective of ayllu is the attainment of well-being or Sumaq Qausay; defined as a positive relationship between humans and their social and natural environments. To this end, great focus is given to achieving equilibrium between one’s natural and social surroundings and to maintaining reciprocity between all “beings”; including the Earth. This practice has proven pivotal to maintaining high biodiversity and has been described by scholars as the product of common-field agriculture. 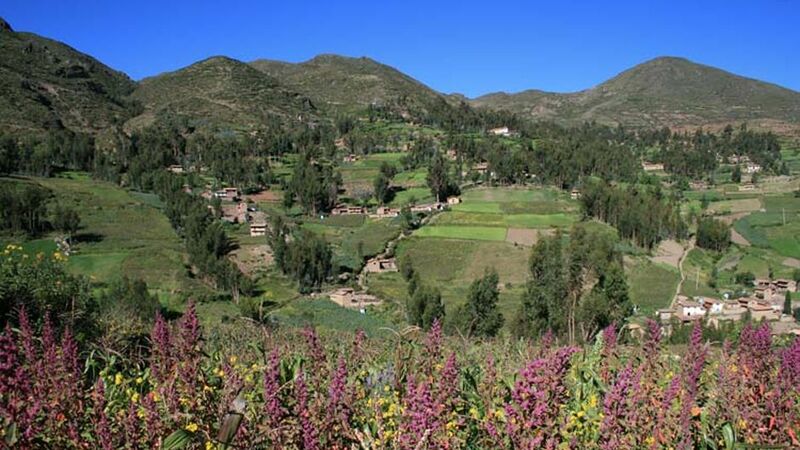 Attesting to this, the majority of subsistence and agricultural activities in the Cusco Valley are based on diversifying uses and the priorities and values of the communities. This community focus can best be seen in the several economic collectives that have been established with the objective of conserving and sustainably using biological resources; utilizing such tools as Local Biocultural Databases and audiovisual recordings that store traditional Andean biocultural knowledge, seeds repatriation and conservation and provides benefits for the often marginalised women of the Andes. This revitalization of traditional Andean systems is promoting a reciprocal relationship between the people of what is known as the Potato Park, and their environment. The Potato Park is a unique model of holistic conservation of the Andean traditional landscape with a focus on conservation of agrobiodiversity (Argumedo, 2008). The Park is located within the Cusco Valley, covers at total of 9,280 hectares, and has a population of 3,880 inhabitants. First human settlements in the area are dated at some 3,000 years ago. The Potato Park is also the centre of origin of the potato, nurtured for centuries by the deeply rooted local food systems of the Quechua peoples. The region is home to eight known native and cultivated species and 2,300 varieties of the 235 species and over 4,000 varieties found in the world. Also found in the region are 23 of over 200 wild species found in the world. The genetic diversity found within just one plot in the area can reach up to 150 varieties (Chawaytire community, Potato Park). 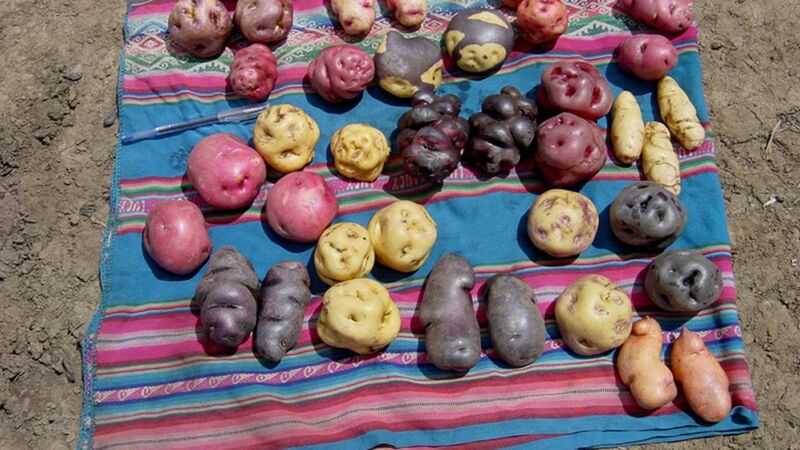 Apart from potatoes, other native Andean crops such as olluco, beans, maize, quinoa, wheat, tarwi, mashua and oca are produced. Photo by The International Institute for Environment and Development. However, the European invasion and colonization of Peru had profound consequences for Andean landscapes, resource use and maintenance of sustainable food and economic systems for livelihoods. Today indigenous communities are confronting the impacts of colonialism by regaining their strength and inspiration from their own native identity and unique association with the land. Their survival is attributed to their endless patience and a profound spiritual reverence for the Pacha Mama (Mother Earth) and their ecological ayllu, and to their knowledge and innovation systems, which are based on sophisticated understanding of their mountain environment. This has provided them with an indigenous environmental ethic which has fuelled a conscious effort to preserve their environment and has propelled the creation of new mechanisms to conserve and sustain their natural resources. The case of the communities of the Potato Park demonstrates the deliberate efforts of Quechua communities to maintain diversity in domesticated and non-domesticated plants and animals, which characterizes Quechua farming systems, providing an important opportunity for a dynamic maintenance of genetic resources and landscapes. The Potato Park initiative seeks to conserve the landscape and nurture the diversity of native crops, particularly of the potato, and their habitat, as well as enhance the interrelations between native crops and the physical, biotic, cultural environment, and to use such interactions to create multiple livelihood options for local people. The Potato Park is a locally managed Indigenous Biocultural Territory using the Indigenous Biocultural Heritage Area (IBCHA) model developed by Asociación ANDES. An IBCHA incorporates the best of contemporary science and conservation models and rights-based governance approaches, including the IUCN’s Category V Protected Areas, as well as positive and defensive protection mechanisms for safeguarding the Collective Biocultural Heritage (CBCH) of indigenous peoples. The main subsistence activity in the Potato Park is agriculture and animal husbandry. Just over 13 per cent of the park area (approximately 1,133 hectares) is used for permanent agriculture of corn, tarwi, potatoes, beans, barley, and other crops, while 33.81 per cent of the park area is made up of tundra, or land that is resting. Crop rotation occurs every three to nine years. First, farmers cultivate potatoes, masha and oca, then the land is left fallow. During fallow periods, many medicinal plants can be found in these plots. The majority of subsistence activities are based on diversifying uses. For example, native potatoes, depending on their level of quality are used either for consumption, seeds, sale, fed to animals or for barter. Barter is mainly used at the household level, and women play a big part in managing the barter system, given their knowledge on both quantitative and qualitative value of their products. Women also play an important role in the process in selecting potatoes for diverse uses, as they are the most knowledgeable in selection criteria and characteristics for the different uses. One of the goals of the Potato Park has been to establish an alternative development model, on that is inclusive and supports cultural identity and conservation of biocultural heritage. 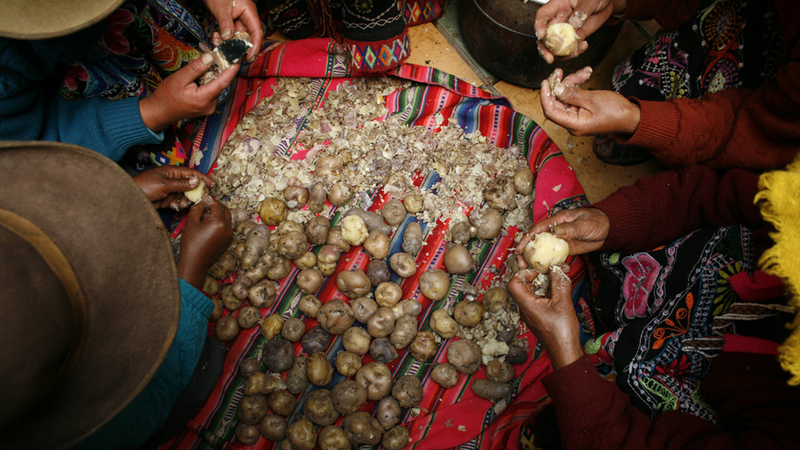 As part of this mission, ANDES and the Potato Park worked together in establishing several economic collectives with the objective of conserving and sustainably using biological resources and achieving a creative and solid economy based on those resources. The collectives include the Potato Arariwas (a seed repatriation and conservation collective), the Naupa Awana craft collective and the Sipaswarmi Medicinal Plants Collective. In relation to the latter, the production of herbal medicines provides safe low cost medicines for families in the Potato Park, and the production and processing of herbal products for sale to tourists also provides additional income generating opportunities for local women. Their traditional knowledge is promoted and protected through the use of a multimedia database. At the same time as traditional knowledge is drawn from, elements of western medicine are also introduced, such as first aid and preventative. In the historical review of the Potato Park landscape, it is possible to see how the indigenous biocultural system survived the colonial and modern attempts to displace Quechua people through land grabbing and the marginalization of Quechua social, cultural and economic life and customary laws, practices and institutions. Though the ayllu was dissolved as a social and political entity during this time, it remained an indigenous cultural landscape. In fact the ayllu landscape not only survived but it adopted the best of the newcomers’ resources and practices. This approach strengthened its main features, enabling it to reproduce itself, forming a rich mosaic of productive and natural areas that provide habitats for all the beings with whom they share their territory. In this respect the continuing resilience of the system is understood through the Andean awareness of complex and chaotic interactions producing order. Supporting adaptation, which will become increasingly relevant in the context of climate change impacts, becomes an important aspect of the Potato Park’s management. Over the last decade, the international conservation community has begun to appreciate the need for new approaches to landscape conservation, based on local cultural and ecosystem contexts (Brown & Mitchell, 2000). The Potato Park case study is just one example of how traditional systems can promote reciprocal relationships between local people and their environment. Based on their progress to date, local communities are well positioned to enhance the conservation and sustainable use of biodiversity, local livelihoods/human well-being and the ecological integrity of a landscape that is the product of a relationship over millennia. This article is based on a study conducted as part of the program activities of the Satoyama Initiative, United Nations University Institute of Advanced Studies (UNU-IAS). The Thriving Biodiversity of Peru’s Potato Park by Bernard Yun Loong Wong is licensed under a Creative Commons Attribution-NonCommercial-ShareAlike 3.0 Unported License. Mr. Bernard Yun Loong Wong works as a consultant for the Satoyama Initiative at the United Nations University Institute of Advanced Studies (UNU-IAS). He specialises in forest ecosystem studies, where he combines ecology and history in demonstrating the contributions of past human activities to the establishment of old growth natural forests in Japan. His other interests include the philosophical and cultural aspects of traditional landscape formation, and historical interactions between people and the land. Mr. Alejandro Argumedo is Director of the Association ANDES, a Cusco-based indigenous people’s non-governmental organization working to protect and develop Andean biological and cultural diversity and the rights of indigenous peoples of Peru. He is also the international coordinator of the Indigenous People’s Biodiversity Network (IPBN), and Senior Research Officer for Peru of the ‘Sustaining Local Food Systems, Agricultural Biodiversity and Livelihoods’ Programme of the International Institute for Environment and Development for England. Why are they taking the skin off?